The humble cross is arguably the most recognizable and iconic symbol for all Christian faiths. One of the more common forms of the cross, are the wall mounted crosses that can be seen in places of worship, as well as within our very homes. The cross not only represents the sacrifice Jesus Christ made for us, it also displays our faith and devotion in Jesus Christ, God and the Church. 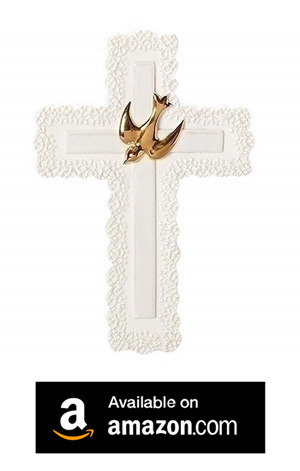 Whether you have a family heirloom that has been passed down through the generations, or have a more modern cross hung up on your wall, you may have noticed that not every cross, new or old, carries the same design. They might be made of different materials or even have more elaborate or ornate decorations. This can be due to the culture that made the cross (as faith is different from culture), the environment or available material and technology may have also influenced their designs. This article will be covering some of the more common designs that are acceptable for the majority of Christian and Catholic faiths. The information below can then help those who are curios about different cross designs make an informed decision when choosing one for their own home or as a gift. As Christians can not display imagery of Christ, we have included crosses that do not depict Jesus Christ himself. 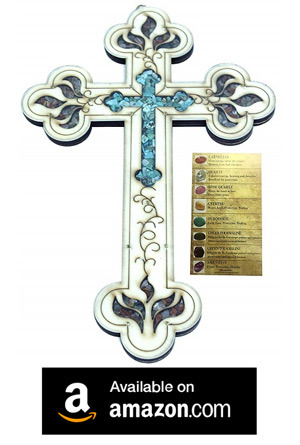 If you wish to purchase a cross that differs from the traditional crosses found below, take a look at our unique and artistic crosses. A Christian cross is any cross that doesn’t have any imagery of Jesus Christ shown on it. Traditionally it is made of two pieces of wood with one longer then the other. The smaller piece is affixed to the longer piece smoothed and given a finish with oil, wax and lacquer. Christian Crosses can be made from a variety of materials however. Made from the slow growing olive tree that was said to have been first grown on the Eastern Mediterranean coasts in 4,000 B.C. 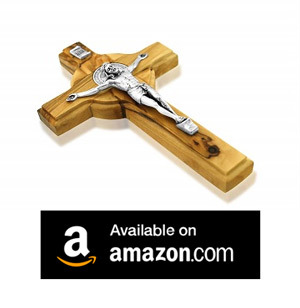 Olive wood crosses are highly sort after by many an enthusiast thanks to its biblical significance from the story of Noah as it was an olive branch that was brought back to Noah by the dove. 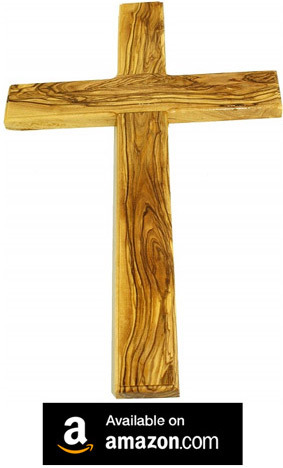 An example of an olive wood cross can be found here. Made from a gorgeous straight grain hardwood. These crosses make for an excellent complement to most households walls, with their attractive deep reddish-brown color and glossy finish. 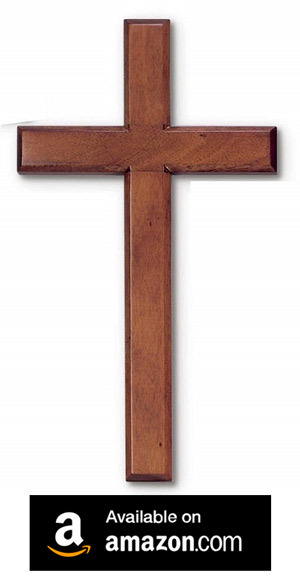 An example of a mahogany wood cross can be found here. Made from porcelain with a glossy white finish. These crosses can have delicate details added to either across the surface or surrounding the cross as either a boarder or backing. Additional images may be used from the biblical scripture, such as the golden dove found on the cross shown in the image above. To get check out these sorts of crosses click here. 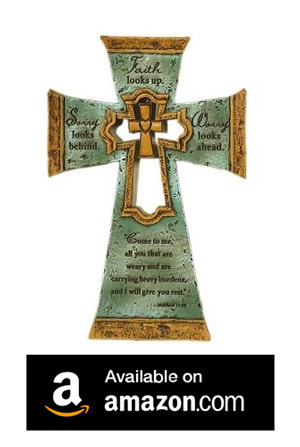 Using the flat face of the cross, inspiring messages or even quotes from the bible can be found printed, stenciled, carved or branded onto the cross’s surface. Depictions of a rising sun, a star lit night or images portraying the biblical tales may be included as part of the imagery. The image above is of an inspirational faith cross and may be found here. 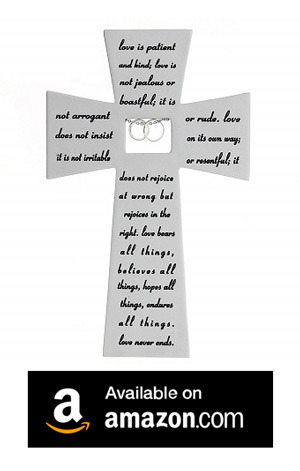 While the image below is of a cross with a poem of love that could be ideal as a wedding gift and is found here. Whether made of wood, steel or stone, may crosses can be found with precious gems, semi-precious gems, mother of pearl, paua shell, colored glass or clear colored plastics inlaid into their surface. The inlay itself could even form the shape of the cross on a plaque or tablet. These sorts of crosses bring an extra burst of color to ones wall and act as a center piece much like any other work of art. The quality of the craftsmanship does have a heavy impact on the presentation of these crosses. 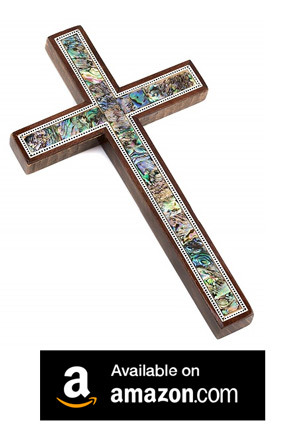 Above is a wooden cross with its core filled with semi-precious gem stones that are sourced from the holy land. There are multiple designs with different stones available that can be found here. Below is a wooden cross that has been inlaid with mother of pearl and shell and can be found here. A prime example of a culture influencing the design of their cross. Those of the Celtic background are very proud of their heritage and show this by including the Celtic patterns in most of their designs. Faith is just as important as their heritage for many Celts, and as such most crosses that are kept or made by someone of Celtic heritage incorporate the Celtic pattern on its surface, or are comprised entirely of the pattern with little to no solid formation. Both designs have a ring connecting all of the arms of the cross. This ring represents the sun and holds special meaning in Celtic culture. 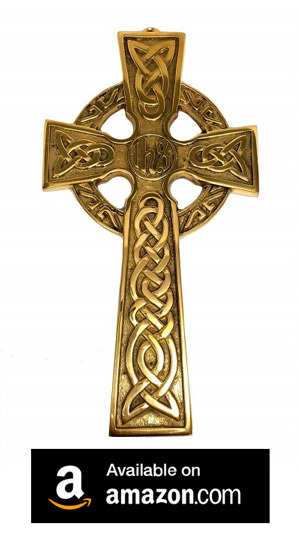 The above image is an example of a solid brass Celtic cross and can be found here. 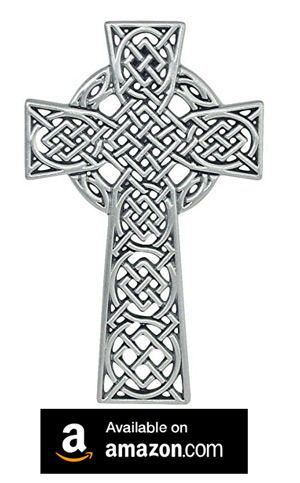 While the below image is an example of Celtic cross that avoids solid formation and is comprised of pewter. This type of cross may be found here. The most defining difference between a Catholic and Christian cross, is the depiction of Jesus Christ on the cross. More often then not, this incorporates a model of Christ being crucified and nailed to the cross. These models may have his head hanging down chin to chest, or to the side. He could be slumped down knees buckled and only his hands supporting his weight. He may even be looking up to the heavens. Some of these crosses would even depict his suffering even further with blood trickling from his thorny crown or from the final wound he received on his side, caused by the holy lance that was used to ensure he was dead. Many Catholics pick their choice of depiction of Jesus’s suffering, based mainly on personal preference. Others pick theirs based on the tenants of their faiths variation or interpretation of the good book. A few examples of crosses that depict a crucified Jesus can be found in the section below. 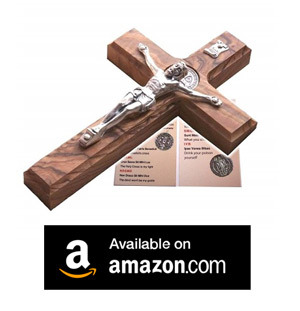 Made of olive wood and featuring the Christian sun, these crosses can be found here. Also made of olive wood, this St. Benedict cross does not include the Christian sun however and can be found here. 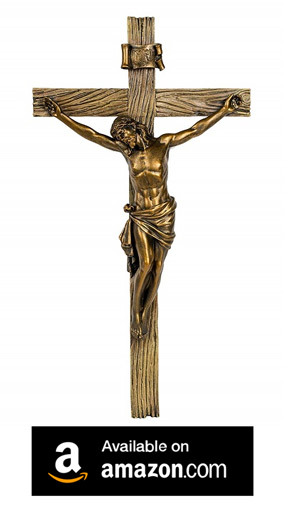 Made from a marble resin, this wood inspired design includes a bronze colored Jesus and may be found here. Another cross made from a stone resin. 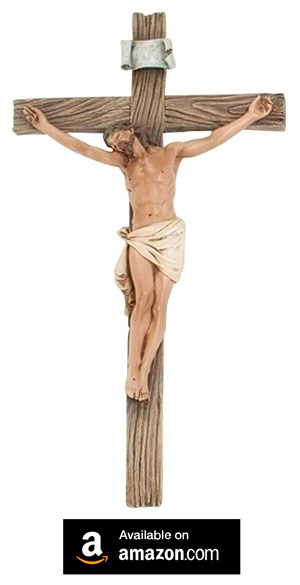 This cross includes a skin toned Jesus and can be found here. 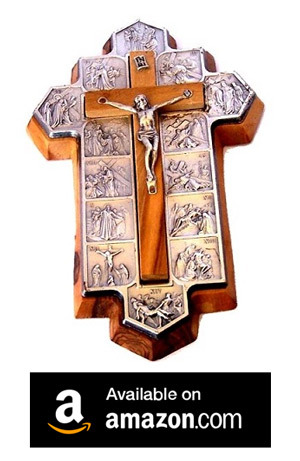 This plaque holds a cross with Christ crucified upon it in its center. The 14 surrounding tiles depict the story of Jesus Christ being crucified and dying upon the cross for our sins. This piece from Jerusalem can be found here.